Residents of a posh Washington neighborhood say Ivanka Trump and her family don't make for very good neighbors. WASHINGTON: Residents of a posh Washington neighborhood say Ivanka Trump and her family don't make for very good neighbors, taking up much of the parking on an already crowded street and leaving trash bags at the curb for days. A big part of the complaint: a huge security presence, with even a trip to the playground requiring three vans. Neighbors of Trump, her husband Jared Kushner and their three children have groused that sidewalks have been closed, public parking overrun and that the family and their staff haven't learned the trash pickup schedule outside their $5.5-million home. "It has been a three-ring circus from the day that they've moved in," Marietta Robinson, who lives across the street, told with The Associated Press. 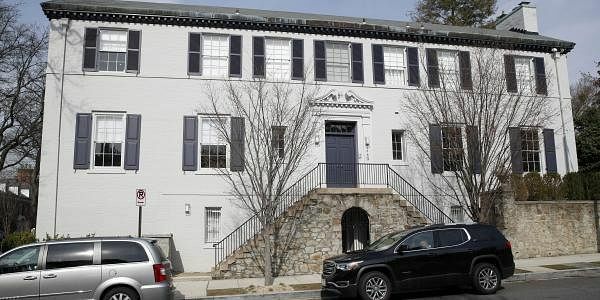 The house in the Kalorama neighborhood was bought in December by a company with ties to a Chilean billionaire. The company is renting it to Kushner and Trump, who moved in just after the inauguration of her father, President Donald Trump. Both work in the White House as advisers to the president. Residents of the enclave of four- and five-story townhomes and elegant single-family properties about 2 miles north of the White House are accustomed to VIP neighbors. Former President Barack Obama and his family have lived there since he left office, and the Secret Service closed off their entire block to traffic. Amazon CEO Jeff Bezos bought a home there, and Secretary of State Rex Tillerson also moved in recently. Yet no one has raised the ire of the community like the Trumps. At a recent neighborhood commission meeting, Fox News anchor Chris Wallace was among those who showed up to complain about parking problems. Some in the neighborhood have also complained about the family's rental arrangement. The company that owns the house didn't obtain a rental license for two months, securing one just this week after it was warned by city regulators. "Maybe some of the upset has to do with politics a little. I couldn't say for sure, but I know that people don't seem to be upset about Tillerson's situation. It's much less intrusive," said Ellen Goldstein, an elected neighborhood commissioner. The Secret Service has sole responsibility under law for protecting the family, but neighbors have noticed what they describe as an unusually large and aggressive security presence. Ivanka Trump arrives and departs in a four-vehicle motorcade, Robinson said. "There are more of them than I have ever seen," Robinson wrote in a letter to Democratic Mayor Muriel Bowser and other city officials. "Frequently several of them are milling outside of the house at all hours having conversations and staring meanly at anyone in view." The letter — which also complained about parking, trash and noise — spurred the city government into action. On Friday morning, District transportation crews were outside the house, removing "No Parking" signs. The department said no permits had been sought for parking exemptions or sidewalk closures on the street since Trump moved in. Yet vehicles associated with the Trump-Kushner house have been seen parking in the restricted areas for hours at a time, and barriers have been erected on the sidewalk in front of the house, forcing pedestrians to cross the street, next-door neighbor Rhona Wolfe Friedman said. Even without extra restrictions, street parking for non-residents is limited to two hours. "The parking patrol on Tracy Place has always been ultra-vigilant," Robinson wrote to the mayor. "Suddenly, the parking enforcement has disappeared." A Secret Service spokeswoman, Nicole Mainor, said agency officials met with neighbors and city officials on Friday morning and addressed their concerns about parking and other disruptions. She declined to answer specific questions about the level of protection the family receives, citing agency policy. It's not clear whether Ivanka Trump is aware of any complaints, saying in a statement emailed Friday afternoon by an aide: "We love the neighborhood and our family has received an incredibly gracious welcome from our neighbors." Christopher Chapin, president of the neighborhood council — who doesn't live as close as the neighbors who've complained — said all the attention is good for Kalorama. "We are delighted to have political figures like the Obamas, the Kushners and the Tillersons living in our neighborhood," he said.